This long-awaited debut CD is a compilation of Dan's most loved original fingerstyle songs. From upbeat toe-tapping tunes to melodic songs that will make your heart sing, this CD is perfect for every acoustic guitar lover. 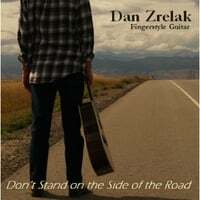 Dan Zrelak is a self-taught musician who picked up his father's guitar when he was 12 years old and has been playing ever since. A well-respected fingerstyle guitarist playing throughout Colorado, Dan is a guitar player’s guitar player. Not only is he respected by his fellow guitarists, music lovers from all backgrounds are awed by his musical prowess. However it is not just Dan’s ability to play skillfully that sets him apart from other guitarists, but his ability to thoughtfully convey a particular emotion in each one of his songs. That is why he touches everyone who is blessed to have the opportunity to hear him, a sentiment you will no doubt agree with.